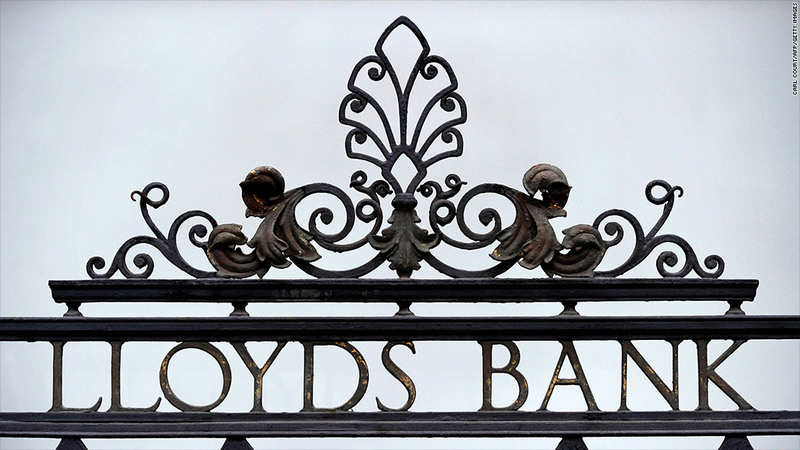 The U.K. government said it would sell its 39% stake in Lloyds. The U.K. government is actively preparing to start unwinding its ownership of two of the country's biggest banks, which it bailed out during the financial crisis. Lloyds (LLDTF) and bigger rival Royal Bank of Scotland (RBS) were rescued by the U.K. government in 2008 and 2009 to prevent collapse of the banking system and economic catastrophe. The U.K. paid about £66 billion ($100 billion) for stakes of 39% in Lloyds and 81% in RBS. Chancellor George Osborne said Wednesday he was actively considering options for selling the Lloyds stake but gave no timetable. The government would also consider splitting RBS into good and bad banks, he said, but a sale of RBS shares was "some way off." The first Lloyds shares were likely to be bought by big financial institutions, but a later sale could be offered to small investors, he said. In a speech to business leaders in London, Osborne also said he would adopt two key recommendations of a parliamentary review into banking standards. The changes would establish a new crime of reckless misconduct, which could expose senior bankers to prison in the future, and allow the government to cancel executive bonuses if it needs to bail out a bank. Since the rescue, RBS and Lloyds have shed bad assets, repaired their funding and started making money again. The government has faced calls to privatize the banks quickly to help complete the repair of the financial system and accelerate anemic economic growth -- a point reinforced by outgoing Bank of England Governor Mervyn King. King said Wednesday that the U.K. banking system was still highly leveraged despite the clean-up operation, with assets worth four times annual gross domestic product, and as such unable to make a real contribution to economic recovery. "It must be time for decisive action," King said. "Britain needs a thriving banking system to serve households and businesses, and Lloyds and RBS will be able to play that role to the full only when back in the private sector." The government knows that selling the shares at a loss to taxpayers at a time of austerity would be deeply unpopular with voters just a year before an election in 2015. It paid just over £5 a share for RBS and 73.5 pence for Lloyds. RBS is currently trading at around £3.20 and Lloyds at 62 pence. Former investment banker James Barty and accountant Emily Redding argued recently in a Policy Exchange paper that the headline losses should not stand in the way of moving the banks back into private hands as soon as possible. Deducting fees paid by the banks to the government, and using the government's book value on the shares -- taken from the closing price on the day they were bought -- they claim that its holdings are worth about £3.60 per share for RBS and 53 pence for Lloyds. RBS shares tumbled last week after its CEO Stephen Hester shocked investors with news that he would be leaving at the end of 2013. Analysts said the move smacked of political meddling and disagreements over when and how the bank should be privatized.